(The Root) — Here we go again. The debate over welfare reform is raging because of a "misleading" political ad from Republican presidential nominee Mitt Romney that accuses President Obama of "a plan to gut welfare reform by dropping work requirements." Everyone and his mother have pretty much refuted its claims, including some members of his party. Factcheck.org reported that Ron Haskins, a former Republican House committee aide who played a central role in the 1996 welfare reform legislation, explained that the ad is misleading. "I do not think it ends welfare reform or strongly undermines welfare reform," said Haskins, who is now the co-director of the Brookings Institution's Center on Children and Families. "Each state has to say what they will do and how that reform … will either increase employment or lead to better employment" of recipients. Newt Gingrich, the man who famously said this January that he would "go to the NAACP convention and tell the African-American community why they should demand paychecks instead of food stamps" while campaigning for the nomination, has even said that there is "no proof" of the statements made in Romney's ad. However, he still has claimed — in an interview with CNN's Anderson Cooper — that someone with President Obama's ideology would be "comfortable sending a lot of people checks for doing nothing." Therein lies the rub — even though Romney's ad makes questionable claims and President Obama hasn't attempted to lower the work requirement in order for welfare recipients to get benefits, many folks like Gingrich and House Speaker John Boehner are willing to perpetuate the image of black folks on welfare in order to curry favor with the extreme elements of the Republican base. You may recall that Gingrich called President Obama the "food stamp president" when campaigning for the GOP nomination. 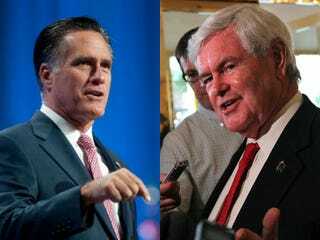 The only truth in Gingrich and Romney's statements is that racism is alive and well in America. Why else would anyone believe something as illogical as dropping the "work" from the "welfare to work" program? It makes no sense. What's interesting is that despite the facts (like states wanting to determine what qualifies as "work"), many Americans are willing to believe what they're fed. The same idiots who assume most people on welfare are black are the same idiots who argue President Obama is Muslim. When all else fails, "blame a black man" and "blame a black woman" tactics are often employed by Republicans to ensure that the lies stick. The only thing sadder than adults behaving as petulant children (being obstinate and claiming to be right when dead-wrong) is blatantly lying on folks. As the kids would say, "You ain't got to lie, Craig." There is plenty that one can critique about President Obama's decisions, but dropping the work requirement in welfare reform is not one of them. Appealing to the lowest common denominator — racism and hatred — is pretty weak and unconscionable. Some folks would rather bury their heads in the sand, conjuring up images of Reagan's welfare queens lying on their backs, pushing out babies and collecting government checks, than think for themselves. Implicit in that strategy of linking Obama with a notion that black folks like sitting around collecting checks for doing nothing is the inherently racist ideology that all black people are the same. That's just what Romney, Gingrich and some Republicans are banking on in order to win the White House in November. That's pretty disappointing.